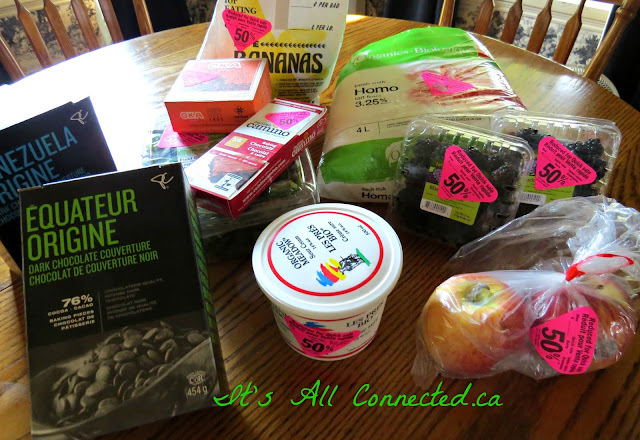 and I wanted to see how many non organic foods could be economically replaced by budget shopping. There is only one grocery store in the town near me and their organic section is pretty small. Organic bananas were cheaper per pound than regular and I bought an extra bunch of 1/2 price ones that were a bit over ripe. They'll get mashed and frozen for muffins and banana bread. The chocolate is for a recipe I'm trying tomorrow. Completely healthy hard chocolate coating for ice cream anyone? Oh, yeah! There were no bad ones in the raspberries. The apples will get used in cooking. The salad field greens are still ahead of the best before date, as was the sour cream. The Oka cheese is a gourmet brand from Quebec and usually sells for about $9. The milk has a while before the best before date but I may have to freeze one of the litres if I think it's going to go off. All of this was marked to half price. The cashier that was checking me through asked why I was buying it all. I explained what I was doing and she started talking. Cashier: You know nothing is really organic if it has contaminated ground water flowing to it and air pollution falling on it. Me: I know. I'm avoiding all the extra chemicals being dumped on it. Cashier: We have a garden and our own apple trees and don't use any chemicals. Everything grows just fine and the apples are perfect. Me: You don't get worms in the apples. Cashier: Nope and I'd rather cut a worm out than eat all that junk. Me: That's how I feel about having my own chickens for eggs. Cashier (perking right up): I'd give anything to have chickens! Maybe I will get some. Looks like you did pretty well in here today! She's smiling and I'm smiling. We connected and we both felt good about it. If you think he looks a little confused in this shot, it's because he can't believe I'm asking questions about what it is like to be an independent farmer today. I tell him what I am writing about and let him know he is free to not answer any question that makes him uncomfortable. Me: Do you work off the farm as well? Farmer: Up until five years ago I did. Now, I can't keep it all up. I've been married 42 years and my wife has had a full time job every one of those years. We're tired. Me: So you have been subsidizing the farm with your other incomes. Farmer: Uh, yeah. My son wants to take over the farm and I want him to but I can get a quarter million for the land and retire. He says he'll buy it but I told him he'd never be able to make the payments and earn a living. There's not enough profit. 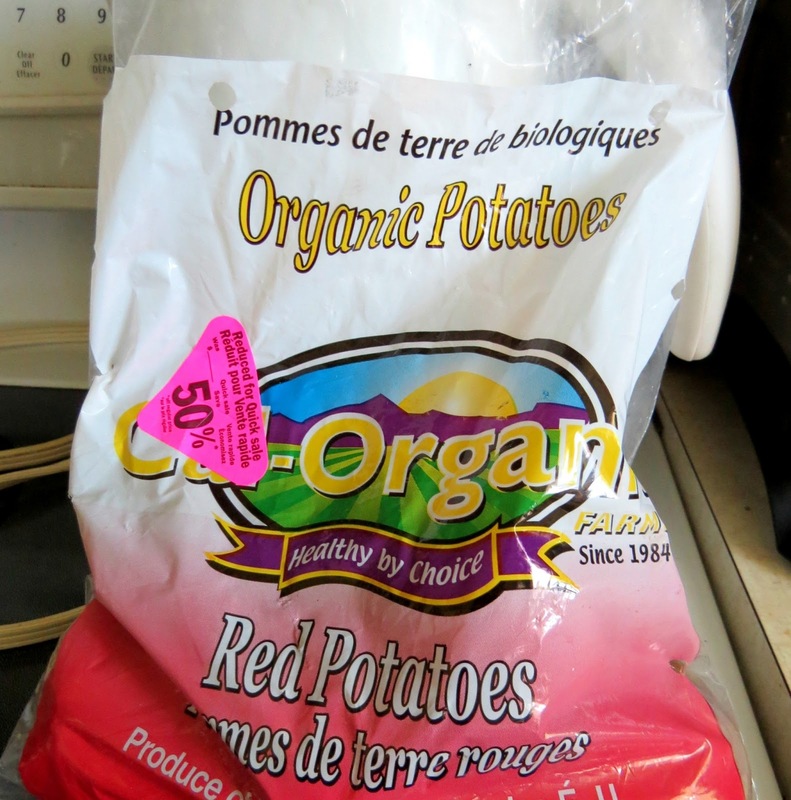 Me: You aren't an organic farm, so what's the advantage to someone buying from you over a grocery store? Farmer: Hmmm. It's fresher; picked that day. We don't use many chemicals. They cost too much to use anyway. Me: You use far fewer chemicals than a big operation would? Interesting. Farmer: For example, we pick our apples by hand or shake them out of the tree. Big growers spray them with stuff that makes the stems weak and they fall off on their own. Me: If running a small farm doesn't pay, why do you do it? Farmer: You're going to make me cry. My dad ran this farm and his father ran it before him. It's what we do and I love it! We talked a bit more and discussed how difficult it is for young families to choose to buy from local farmers and pay more. Farmer: I really get that and don't know how they handle food prices today with little kids. Ordering a quantity will always get them a better deal. 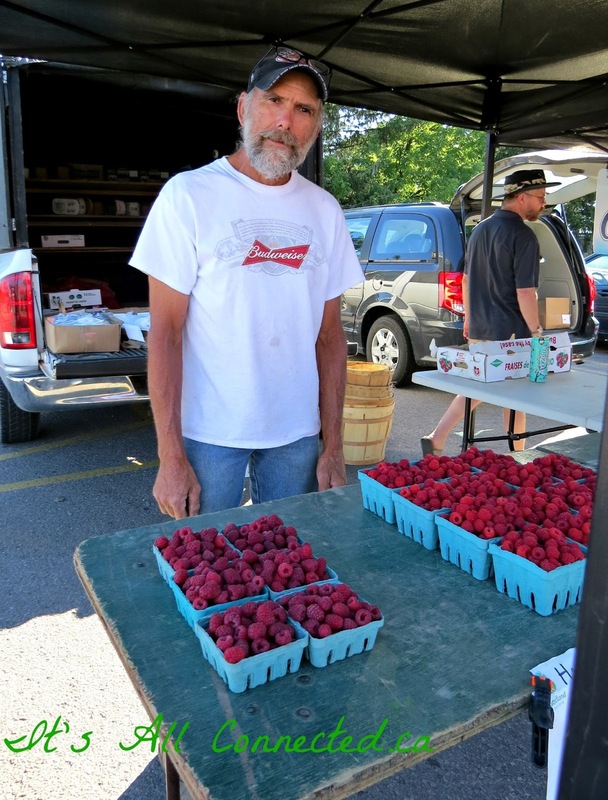 Right then, a little girl asked her mom to buy some of the farmer's raspberries. Her mom said they should wait and get the big package from Costco. The little girl insisted and got her pint of local raspberries. Farmer: We've farmed in our area for so long, we have plenty of regular customers. Still, my wife reads the obituaries and says, "We lost another customer. So and so died". Kind of ghoulish of her. Me: I guess she knows the next generation aren't going to be buying from you. Or, maybe that little girl will stick to her guns, his son will get to stay on the farm and the apples will continue to get picked by hand. And what did I eat today? 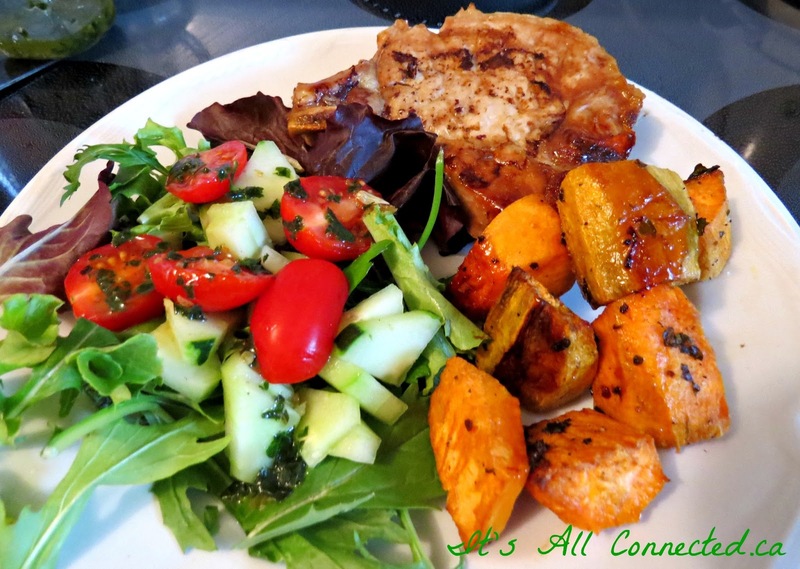 Baked yams bought from a lovely teenage girl at the market, a pork chop raised without hormones or antibiotics and fed vegetable grain and some of that organic salad that was on sale. The best part of all was that this food got me talking to and connecting with the people who grow it and handle it. From the cashier to the farmer to me, we were all consciously thinking about our food and what it means to us. Great post!! I buy organic and/or local as much as possible, which is easier around here than it would be in the city. When we do eat meat, we know where it was raised. ANd of course I've got my own honey, eggs, veggies and berries. The interview with the farmer was very interesting! Goodness, I have never seen produce discounted at my market, good for you and for the education. You are doing a great job and we love following your journey! OMG Now I am determined to put as many fruit trees I can into my garden and never buy from the supermarket (easy for me because I live near orchards.) That is horrifying about the stems. I really enjoyed this post Maureen it's given me a lot to think about! Love the farmer - love the education - love your dinner - it looks ( once again ) fabulous! I had no idea they did that to the apples. Yuck. Great post! My son & his family are part of buying fresh from the farm to their door. Every week the farmer they have contracted with drops off a box of the weeks fresh veggies and fruits. At the beginning of the season they buy a share of his crops with other people and they all hope for a good harvest. So far they love it and have been eating well. Great post Maureen. & That dinner looks delicious too. I love that you are interviewing people for these posts! Kind of an insiders view! Talking to my neighbors last year during the drought was so sad.. many farms are still struggling to recover from it. Sam is picking up some bags of corn from a local farmer for me to freeze today. You're inspiring me with these posts!! Oh my that meal looks so good. We have three stores here called the Salvage Store, there we are able to find organic cereal, breakfast bars, rice, and tea. We saved so much money going to them, especially with two teen boys to feed. 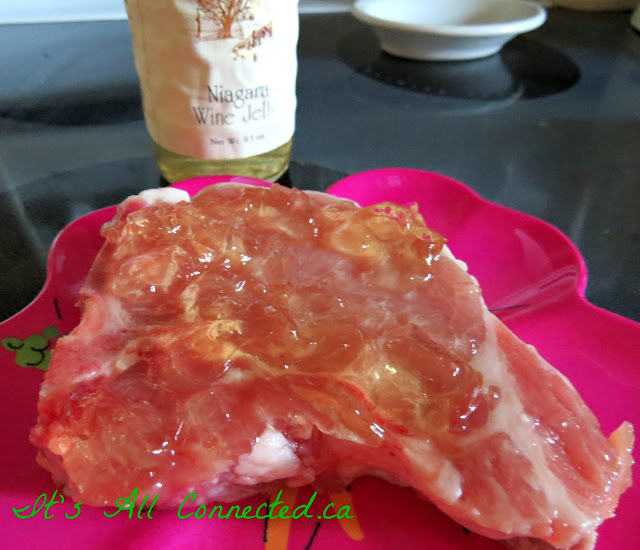 Great post Maureen, the meal looks delicious, I tried the Niagara Wine Jelly but have never thought to put it on pork chops before baking, yummy. Its too bad about the farmer, I have always wondered how they survived with all the 'ready made meals' and buy in bulk. Hopefully his son will take over the farm, let hope. Such an interesting post Maureen. 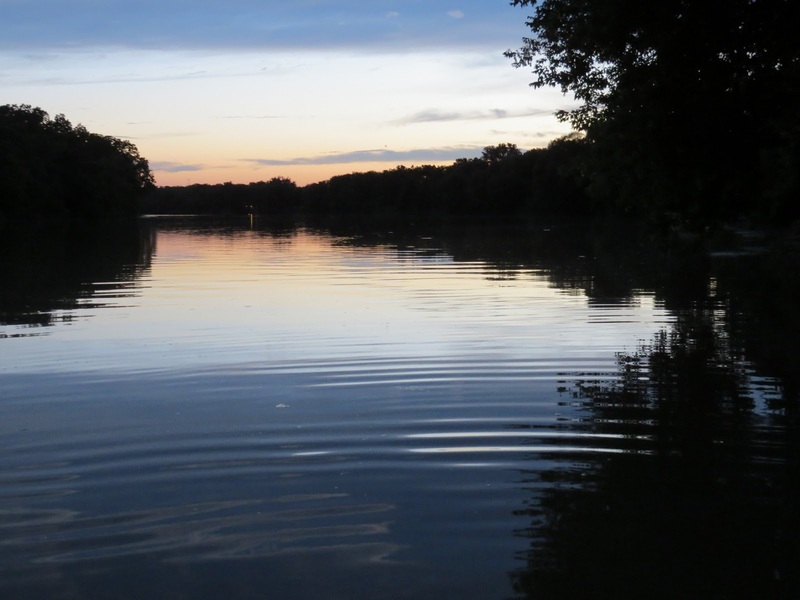 Love the 'ripple effect' and seeing how a lot of people are effected by it. 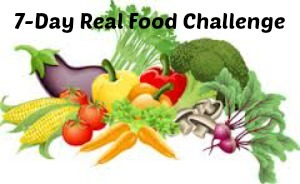 Good for you that you are were able to find bargains on the organic food. I keep forgetting to go by the farmers market when I am in town. Bummer !!! Must make a note, I guess. Your dinner looks delicious. Great post Maureen, love the interview with the cucumber pickler. I can get organic veg delivered to the doorstep. They deliver what's in season, so I might check out the price. I also was inspired by Mel and you and may try to incorporate edible plants into my own garden. It's food for thought !!! Great post Maureen. I love buying and eating local, but don't always do it. It makes me sad that farmers are having to sale their land because they can make more money by doing that. Farming is hard work and one bad freeze can ruin them. I'm so afraid that one day there will be no fresh fruit and veggies. p.s. Your meal looked delicious! Super post and interview! Learn something new every day, although I didn't like to learn about those apples. Tragic that the son can't make a decent living working the family farm.